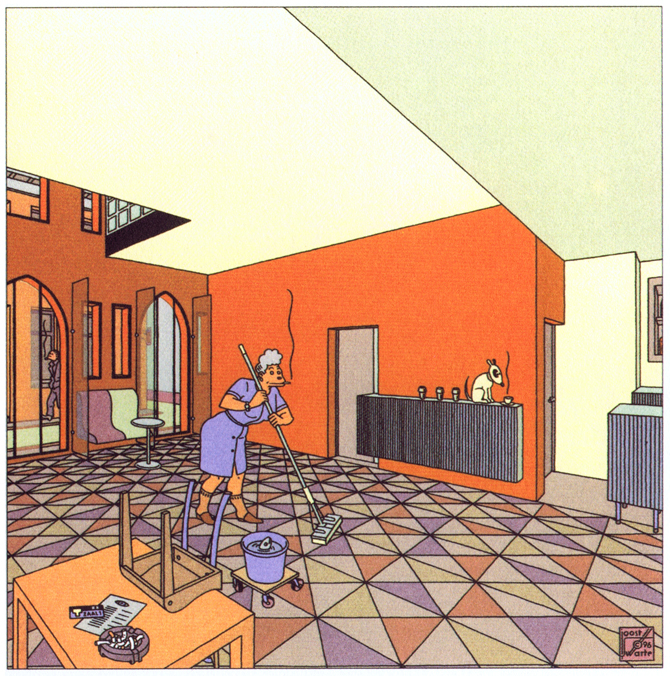 Born in Heemstede, Netherlands, in 1947, Joost Swarte is an artists’ artist, whose klare lign style—a seminal term in comic book scholarship he coined himself—has influenced several generations of cartoonists. 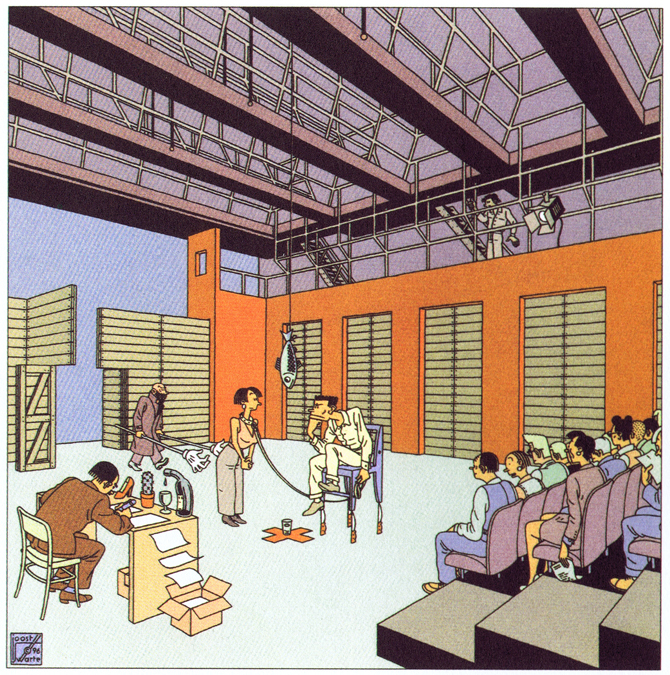 Starting as an industrial design student, Swarte soon moved onto comics and illustration, both as an author, whose work has been displayed in magazines such as HUMO, RAW, The New Yorker, and Abitare; as a publisher, founding the comic magazine Modern Papier and Dutch publishing house Oog & Blik; and as a cultural advocate, being one of the fathers of Stripdagen, a biennial international comic event held in Haarlem. Using comics as a platform, Swarte has built an impressive career that leaves no field unexplored, from graphic design (magazine covers, ex libris, stamps, and stained glass) to furniture design and, most interestingly, architecture. 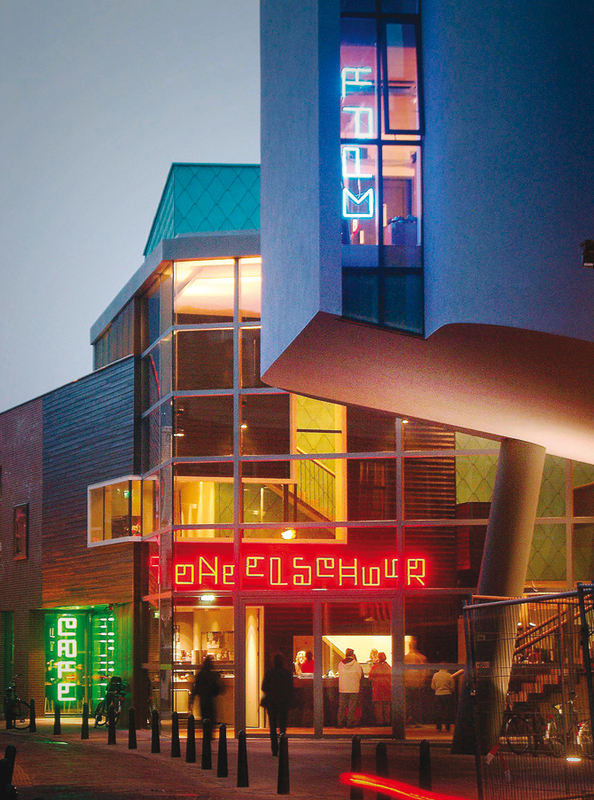 Since the late 1990s, when he was contacted to design the Toneelschuur, a new theatre for his hometown Haarlem built in collaboration with Mecanoo, Swarte has developed a parallel, growing career as a consultant in architectural design. KLA: Before turning to comics, you started studying industrial design. Was this something that you had a previous interest in? Or was it something that you chose by discarding everything else, as it happens to many people entering architecture schools? JS: After high school, I started studying industrial design in Eindhoven because I didn’t know so much about the design world. I had a strong cultural interest, I liked to draw, and I had a technical interest, so I thought, “This seems to be a good combination, so it’s probably something for me.” And it was. I liked it a lot, but within the comics I had more possibilities to express myself. So, I decided to quit my studies and be a comic artist. KLA: So you already had an interest in comics prior to entering the school of design. JS: I already had an interest in comics, and it developed throughout my time at the design academy. When I started to do some comics, it was a kind of cultural comment. I published them in a cultural magazine, in the south of the country, and then I made more. My production of comics was more than I was asked for, so I decided to develop my own magazine. It was a primitive structure, but it gave me a lot of experience in the field. I never thought of it as a career, but in 1973, a long-time friend introduced me to Charlie Mensuel. It was just after two or three years doing comics, when I changed a bit the style. It had always been inspired by the liberal and literal freedom of American underground artists like Robert Crumb, Gilbert Shelton, Spain Rodriguez, and Jay Lynch, but I was also interested in the magic of the comics that I knew from my childhood. I was interested in Hergé, and I was interested in The Spirit—which I knew later as a student. So I worked hard on my style of drawing, and in France they found it very funny that I combined the underground freedom with the style of drawing that we all knew from our youth. At first glimpse, my work from that period looks like a children’s book, when in fact I talk about things that people only know from underground comics. This combination was quite new, and they loved it. So, from that moment on, I knew I could publish everything that I made in France. It was only five years after I started doing comics that I knew it could be a profession. 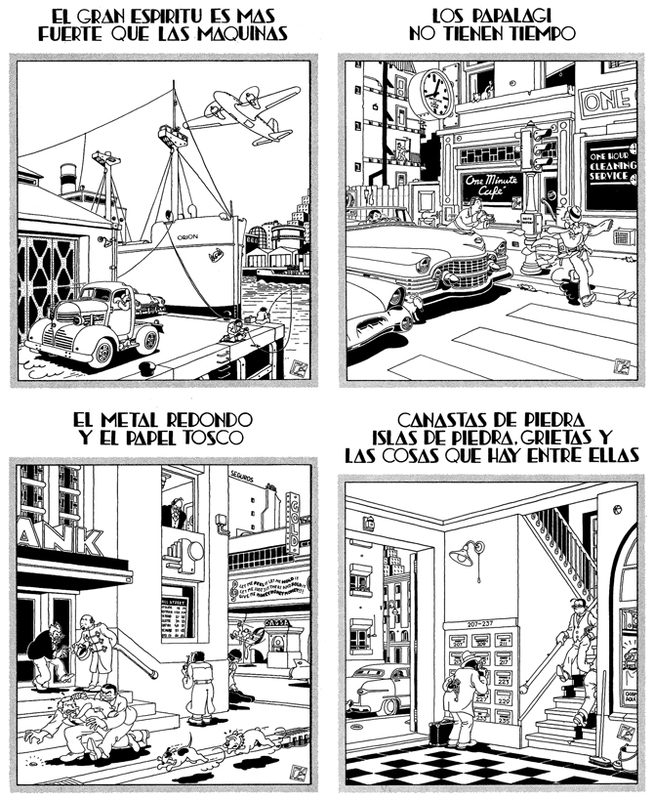 KLA: Something that struck me the first time I read your comics back in the 80s is the stark contrast between the style, that clear line which can be found in children’s books, which also relates to Le Corbusier’s renderings. JS: Well, the case is that this style of drawing makes it possible to draw technical details. I can almost draw like an architect, and show the essence of the construction. With the clear line, it seems quite logical, and as I am interested in all sort of technical details, I can express myself quite well with this style. KLA: There is a strong neo-plastic flavor in your work. Your designs have a certain ‘Reitfeld’ flavor to them, and there is a certain early modernism in your approach. Would you say De Stijl has been an influence on you? JS: That’s right. It’s a period where the architecture got rid of decorations, and went back to the essence of what is space. And I am always looking for the essence. If I illustrate an article, I try to find out what in fact is the content of the article, and try to reduce it to a simple thing, without making it too naïve. It’s better than talking about a hundred details. In architecture, it’s not easy. If you want to have a simple connection, it asks for a lot of preparations. So, I like to have it look simple, but in fact it’s a lot of work. But that’s fun, it’s sort of a puzzle. The movement of De Stijl was a great influence. Gerrit Rietveld was even more influential. KLA: You also tend to use a lot of axonometrics in your representation of space, which makes sense within the context of the abstraction, objectivist quality of the clear line style. JS: Yes. The perspective drawing with vanishing points is one language, but there are other languages; it depends on what I like to draw. I use isometric projection often in stories, because it makes it possible to give a strong meaning to something that is far away, and I can use it in much of my storytelling. KLA: One thing that you also kept from this era is that you practice a whole range of disciplines. You have completed the whole circle from industrial designer to comics artist, then back to architectural designer. When did this full circle come to happen? JS: When I was still a student I found out that art, design, and architecture are very nearby, and often in institutes it is divided in different sections. I like to do different things, so to me it was never a goal to focus on one of the disciplines. I liked to do them all. One artist that I am especially interested in is Joaquín Torres García. He made stained glass windows, paintings, but also wooden toys… I never lost my interest in architecture. 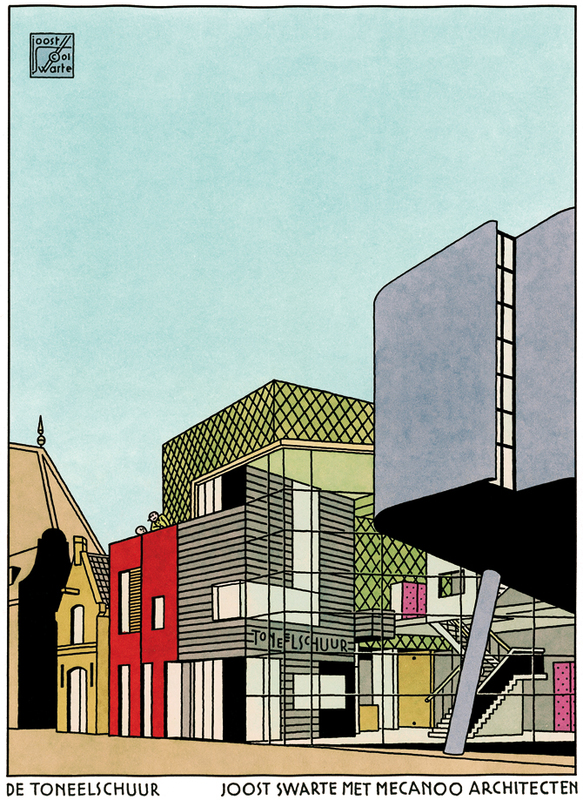 When I started doing comics, my first comics often had architectural subjects. 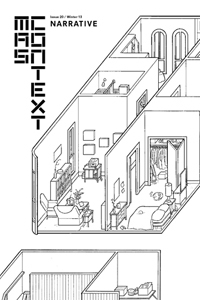 I kept up with what’s new in architecture, and I collected books on architecture, and each time I needed to draw houses and buildings, I considered it as sort of a study. KLA: Before the Toneelschur, you had already developed several design tasks, even some furniture. But how did the commission for the theater happen? KLA: Did they just want an idea, or did they give you a full program of necessities? JS: There was a huge program. They had a program of about 150 pages. They knew exactly what they wanted; they knew what wood should be on the floor for dancers, for instance. Within the limitations of the program, they gave me 100% freedom. I came up with lots of ideas. In the early developments, I had a friend architect that I visited sometimes, and he could give advice to me. I often came to the organization to discuss my ideas and, from the beginning on, they were only positive. KLA: How did you approach the design? As a comic artist and illustrator, did you start with images? JS: I never start with an image. It is always trying to solve problems. Of course it’s not an objective thing, because you involve some personal elements; a function is not something objective. I started by finding solutions for the major problems. In Holland, there is a law that says that set decorations should be changed within the building, so, there should be a garage in the building. And it was in the center of town, on a very small street. I solved the problem by saying that we should make an extra alley where this truck could come in. Within the old part of town, we have smaller houses so I decided to give each part its own façade, with its own material. There are two theater halls and you can recognize them: one is green with copper, and the other one has dark grey bricks; then you have two cinema halls, and, in a way, they are both pavilions, with purple stucco. Then there is the entrance building, which has also an old façade made out wood, and then we have the café, which is built out of red brick. It looks like a collage; it divides the building in many, many smaller parts, so it fits well in the center of town. The people who lived in this section of town were very happy that I wouldn’t design one, immense building in their neighborhood. Also, the idea was to work in the new theater with the same amount of people, even if the volume of the theater would be twice as much as the old one. And, of course, an important thing is how light comes in the building. With all of these elements, I started to make little sketches. And from the puzzle of solving these problems, came the idea to provide each part of the building with its own visual exterior, to make it as clear as possible. You give each part a specific and personal look. 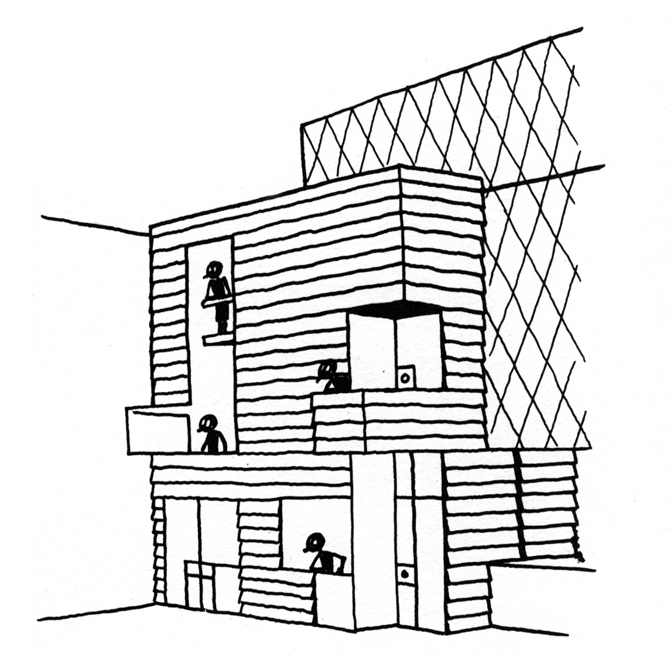 KLA: In terms of the spatial design, did you use models, or primarily drawings? JS: Well, I started with drawings. But then I needed the model to communicate, not only for myself to know what was possible—but to know that the result of my drawings would give an interesting space. I needed it also to explain to the people from the theater what my ideas were, because I know how to read the drawing, but very few people know how. It was crazy. It was all done in secret, because we didn’t dare to tell the politicians that a comic artist would design the new theater. They would think we were crazy. So, only when it was all finished and calculated we invited them for a presentation. KLA: What was that like? What kind of documents did you produce for this presentation? JS: We did an audio-visual presentation with a lot of drawings by me in it, and a portfolio with four silk screens: two of the exterior, and two of the interior of the building. I also made drawings of the structure, of the floor plans, and a little maqueta (model). With it and the plans, we calculated the cost, and it came out that it was a financially possible design. It worked quite well and it was well-received in the newspapers and the specialized magazines. That helped a lot. The community liked it, the politicians liked it, and then they decided to find the money. KLA: How did the collaboration work? JS: It was the architects who made the final drawings, but we had a lot of sessions together. We had consultants for acoustics and installations. 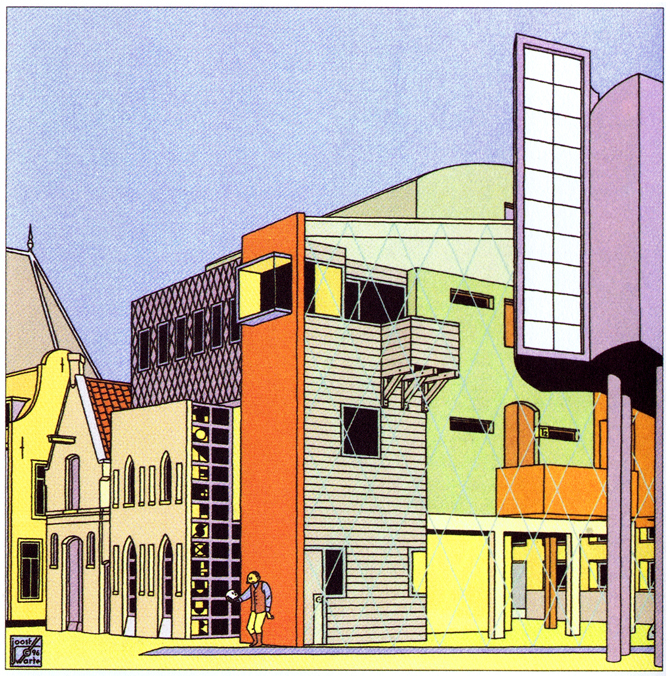 I was often in the architectural studio in Delft, and I discussed how I wanted to have it detailed. That was fantastically done. I followed the whole process from A to Z. While the contractors were building the theater, I often was at the site. Of course we had somebody who was in charge during the construction process, but I checked in. It was easy for me to visit the site, since my studio was a five-minute walk from it. So if there was any problem, I would get a telephone call directly at my studio, and five minutes later I would be there to help. Then, I would communicate this with the architects, so that they knew what was going on. 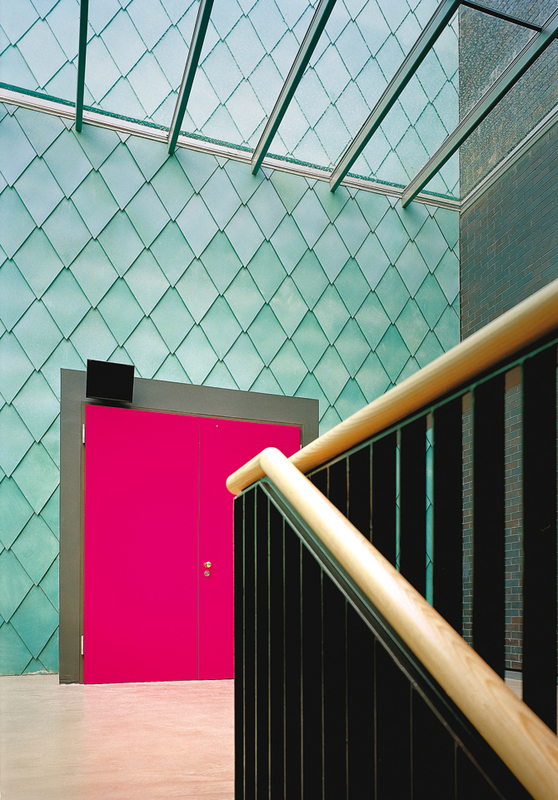 I remember one day I visited the site, and I saw that the color I had indicated for an entrance door wasn’t good. So I went to the contractors and said, “I would like to change this color for another one, because it works better.” And they replied, “That’s okay.” So I went back to this man with the paintbrush, and I said, “I just discussed it, and it is going to be another color.” I always liked very, very much—and this is the sort of the inspiration for such behavior—a photograph of Gio Ponti in a construction site: with a coat on, he is sitting at the table, and he designs details to negotiate, or to show to the people working on it. I like very much people who continuously feel responsible for the final result. That’s something that I do for my books and, inspired by this photo of Gio Ponti, I thought I should do it for the building as well. KLA: So, how does the final result compare to your design? Was the spirit of the design preserved? JS: Yes, absolutely, and the result is better than what I started with. The principles of what I had in mind are absolutely in the final building. It was only changed for the better. The garage is much better than all my first plans, the technical installations got more room… all these type of changes. KLA: Was it somehow a dream come true, bringing your designs to life? JS: In a way it was. I never thought I could be asked to do such a thing. When they came with this question, the first thing that came to my mind was, “Don’t hurry too much,” but I knew that I couldn’t say no to such a demand. I thought, “If I, within a week, can think of solutions for such an architectural problem in an old town, then I will continue to do so.” In fact, I came up with the solution on the first night, and used the other days to check that I hadn’t made any mistake. I couldn’t find a better way, so I decided that my brains were enough “architect brains” to work on the project, and I accepted. In the beginning, when it was finished, it was sort of a dream. I would ride my bicycle from my studio to my house, and then I would pass the theater, I look at it, and think, “Is it real? Is this a dream?” But it was real. And it was really incredible. KLA: I get that your collaboration with Mecanoo was very smooth. Did this spring your interest in doing architectural projects? 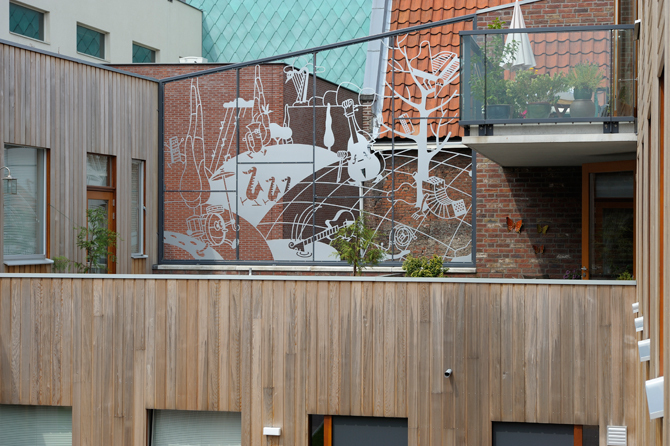 You did some exterior design for the Johannes Enschedé Hof project, also in Haarlem. JS: Yes. It was a very good collaboration and, as a result of that, we collaborated on this smaller project, , a group of houses for elderly people located just beside the theater. I was asked to think about it, but it was at the final state of the theater, and an extra hard job would have killed me. So I discussed it with Henk [Döll, from Mecanoo at the time], and we finally came to the idea that it would be best that he would get the job, and add me in his team of designers. This building had the smaller windows looking on to the street. So I thought, “If I could add some artistic elements in this façade, that would make a better building.” I proposed it, and they accepted. 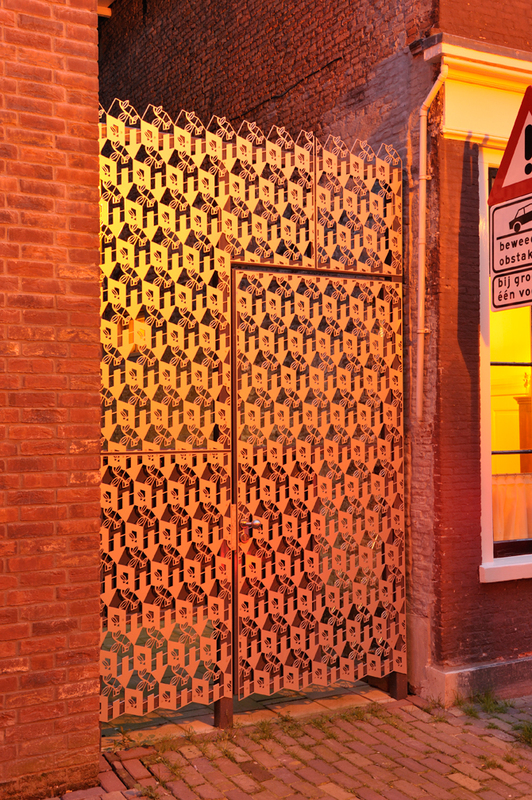 Then, about five years ago, I developed a little apartment building in the center of Amsterdam. The thing here was that I was first asked to design only a façade for the vacant spot. 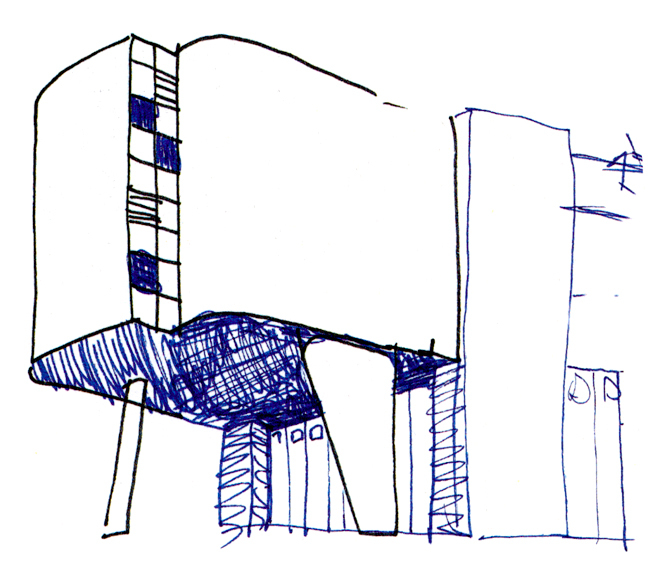 I said, “I can only draw a façade if I know what is behind it.” So they suggested that I work with an architect [Sytze Viseer] to work on the details. They had never had to draw as many details as they did with me! [laughter] And, of course, they also added some ideas. It is always cooperation. It’s a negotiation. KLA: The stained glass work has become an ongoing line of work. JS: Yes, that’s right. Sometimes, you can’t solve all problems within architectural means. Sometimes an extra art supplement helps to make a building sympathique (nice). 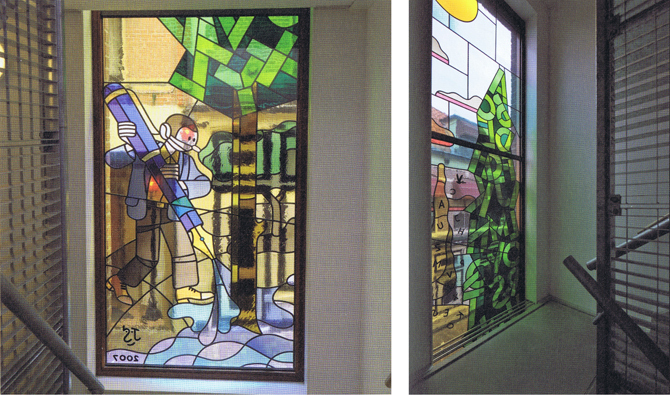 I did a huge stained glass window in the courthouse of the city of Arnhem, and, not too long ago, I did a series of stained glass windows for a chapel in the center of Grenoble and for some schools. Also, I have a project here, that I should start with, in an old industrial building in Amsterdam. It is now an apartment building, so they asked me to redesign the entrance. Another recent project is a kitchen that I designed for friends of ours. That was a nice little project, a project that I could follow from the beginning to the very end. KLA: You do a lot of architectural surgery. Architectural jewelry, actually. KLA: Do you also keep an ongoing relationship with all these designs? 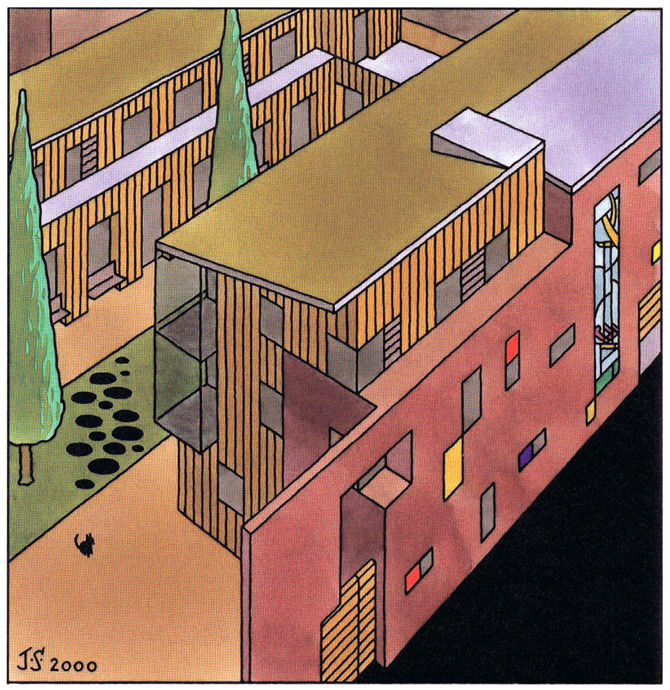 JS: Yes, absolutely—a non-stop architectural curiosity. 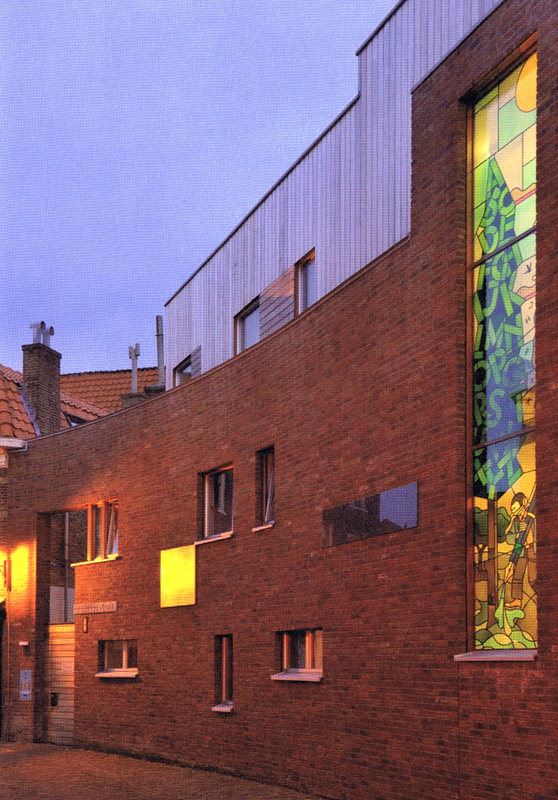 Some of the façade detailing designed by Joost Swarte for the Johannes Enschedé Hof in Haarlem (Henk Döll / Atelier voor Bouwkunst, 2007). © Photographs by Peter Cox provided by Atelier Swarte. 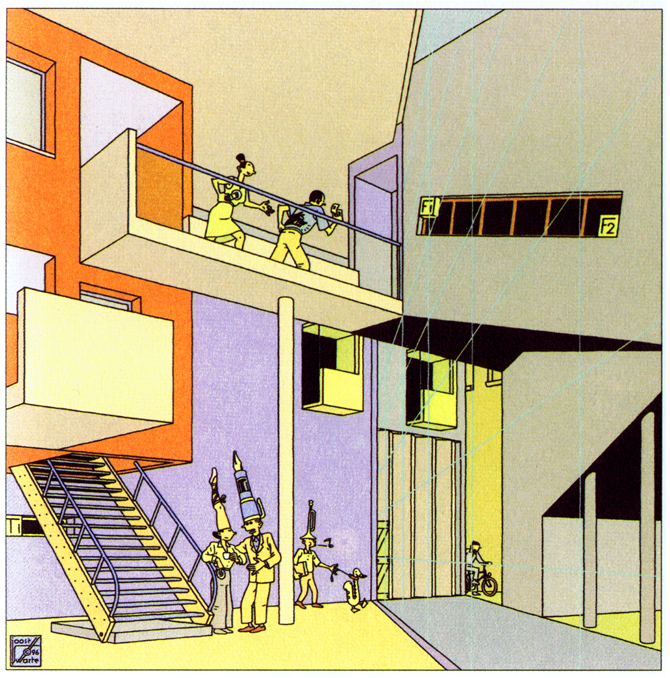 Joost Swarte started to draw comics at the end of the 1960s, while studying industrial design. In 1970, he published his first comic book, and from 1971 on he worked for the famous Dutch comic magazine Tante Leny Presenteert (Aunt Leny Presents). With the comic series Dr Ben Cine & D in VRIJ Nederland he rose to international fame. In 1990 he initiated the Stripdagen, a biennial international comic event that took place for the first time in 1992 in Haarlem, Holland.